Baby eels, also known as elvers, squirm in a bucket outside the Delaware Valley Fish Company in Portland in this April 2014 file photo. An investigation into illegal sales of elvers in Maine last spring has resulted in two Maine dealers facing criminal charges and new rules being proposed for elver dealers. Illegal sales of baby eels that caused last year’s abrupt closure of Maine’s elver fishery have resulted in criminal charges for two baby eel dealers and new rules from the state proposing closer oversight of the lucrative fishery. The alleged criminal behavior, in which some dealers are accused of using prohibited cash transactions to conceal baby eel purchases from the state’s mandated electronic sales monitoring system, is the latest illicit scheme to be uncovered in Maine’s baby eel fishery. Ever since the value of the eels, also known as elvers, jumped from an average price of $100 per pound a decade ago to more than $2,300 per pound last year, fishery regulators have had to contend with increased poaching and smuggling. The Maine dealers accused of making illegal cash purchases of elvers last spring are Roger Bintliff and Freddie Mei, according to Jeff Nichols, spokesman for the state Department of Marine Resources. Bintliff, whose business is based in Dresden, has pleaded guilty to a criminal misdemeanor charge of buying elvers without a required swipe card and has had his licenses suspended for a year, Nichols said Friday. The state suspended Bintliff’s six elver dealer licenses, which allow him to buy elvers at six different permanent locations in Maine, effective Nov. 12, 2018, according to Nichols. Mei — who has multiple licenses and conducts business in St. George, Portland and Newton, Massachusetts — is facing misdemeanor charges in Cumberland, Knox and Lincoln counties, Nichols said. Mei has been charged with transporting elvers without a supplemental license, purchasing elvers without a check, failure to use an elver swipe card, failure to maintain accurate records and transfer of elvers without utilizing an elver swipe card, he said. Though the charges against Mei have yet to be resolved, a two-year suspension of his licenses took effect Nov. 21, 2018, Nichols said. “The investigation into illegal transactions last season continues,” Nichols said. Last May, the Department of Marine Resources decided to shut the fishery down early after the Maine Marine Patrol discovered some dealers essentially buying elvers under the table. Some bypassed the state’s mandated swipe-card system, which was implemented in 2014 to keep track of each elver transaction in Maine, and offered a cash price lower than what they offered for above-board transactions. Because of the high value of elvers — last year’s average price of $2,370 per pound paid to fishermen was a record — the state banned cash transactions in the fishery in 2013. In the few years prior, many elver buyers had taken to openly carrying firearms on their hips to discourage anyone from trying to steal bags of high-denomination bills they used to pay fishermen. The cash transactions also made it difficult for officials to keep tabs on harvest amounts and on anticipated income tax bills. Fishermen and dealers use the swipe cards, similar to ATM cards, to track the amount of money and elvers involved in each transaction. The cards also track how many elvers fishermen have caught toward their individual catch quota and provide the state with real-time data on how much of Maine’s overall annual statewide quota fishermen have harvested. Officials last year suspected that if fishermen and dealers had recorded all of their illegal sales, the state would have exceeded its mandated annual statewide quota of 9,688 pounds, Marine Resources Commissioner Patrick Keliher said at the time. Citing concerns about the overall health of the American eel population, the Atlantic States Marine Fisheries Commission imposed the annual statewide catch limit on Maine in 2015. “This is a fishery that stood to net Maine license holders nearly $24 million this year, and now because of the greed of some dealers and harvesters, I am obligated to cut that opportunity short,” Keliher said last spring. Due to the season’s early closure, Maine last year recorded a legal elver harvest of only 9,178 pounds, which generated $21.7 million for fishermen statewide. The ongoing state investigation follows a more lengthy federal investigation into elver poaching that the U.S. Fish & Wildlife Service conducted along the East Coast from 2011 to 2014. In that investigation 21 men, including 12 Mainers, were convicted of catching, selling and transporting more than $5.25 million worth of illegally harvested elvers in nine states over that four-year period, according to federal prosecutors. Maine residents Joseph Kelley of Woolwich and James Lewis of West Bath are expected to be the last of the 21 defendants to be sentenced when they appear in federal court in Camden, New Jersey, on Feb. 21. The new rules the state is proposing for elver dealers would make it more difficult to conceal illegal cash transactions from fishery inspectors. 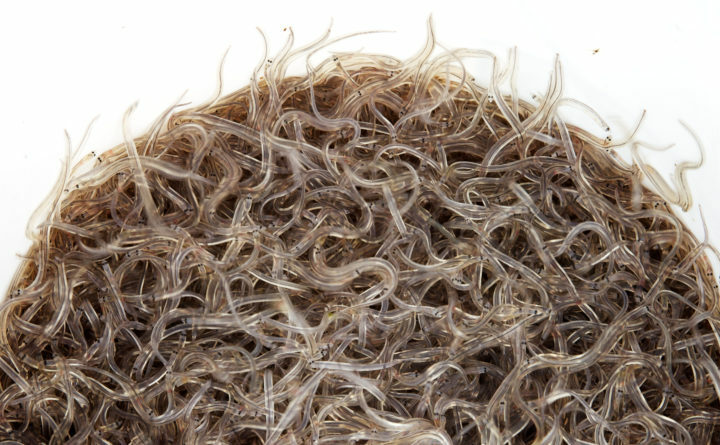 The changes would prohibit more than one elver dealer from buying and storing elvers at the same physical address, and would establish a process for the Maine Marine Patrol to monitor and seal elver packages leaving the state. That added monitoring would allow the Marine Patrol to compare the amount of elvers legally purchased by dealers with those they ship out of Maine, making sure no illegally purchased elvers are included in those shipments, Nichols said. Not allowing more than one dealer at a single physical address would “improve the enforcement of regulations associated with quotas by eliminating the possibility of co-mingling of elvers between dealers,” Nichols said. The Department of Marine Resources has scheduled two public hearings for the proposed rules. One is scheduled for 5 p.m. Monday at Jeff’s Catering in Brewer. The second is set for 5 p.m. Tuesday in room 118 of the Marquardt Building on the former Augusta Mental Health Institute campus in Augusta.